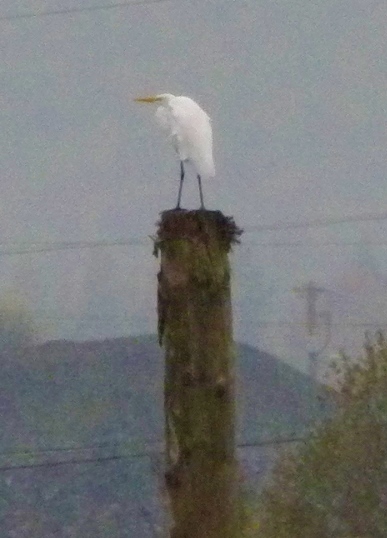 Nels Nelson and I birded Fernhill Wetlands this morning. Truly wet lands, it rained the whole 90 minutes we were there. 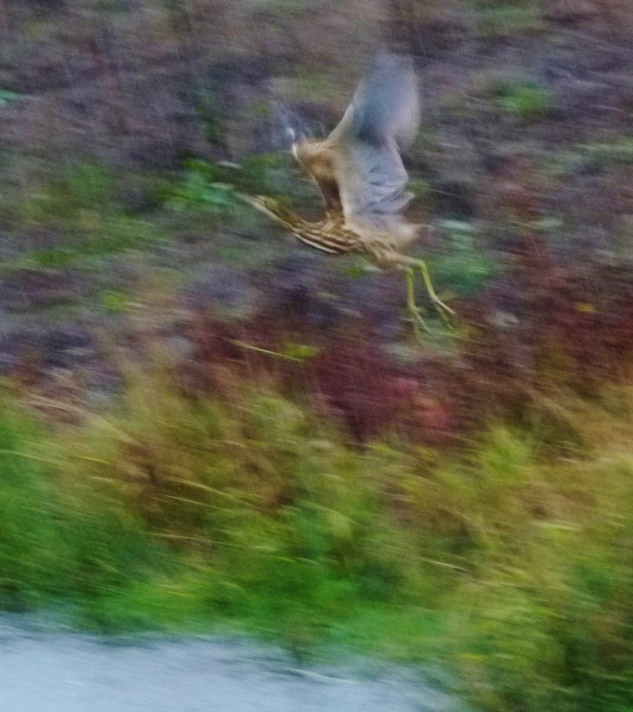 In that rain a lone Barn Swallow appeared out of the sky and hunted over the ponds before heading south. Should have done that long ago it seems. Most of the other Barn Swallows from our region must surely be in Central America by now, worried more about tropical storms than our cold rain. Checking on eBird I find that Barn Swallows have been seen at Fernhill in every month of the calendar though rarely in December and January. They have reported every week through November in the fall, so late but certainly not rare, this lone laggard. Do they make it? 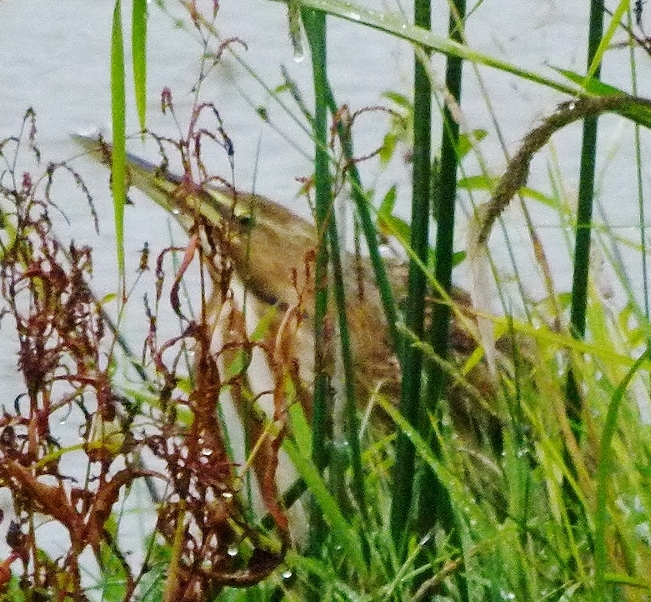 Nice views of Mr. Nord’s “pet” American Bittern near the westernmost kiosk on the dikeway. 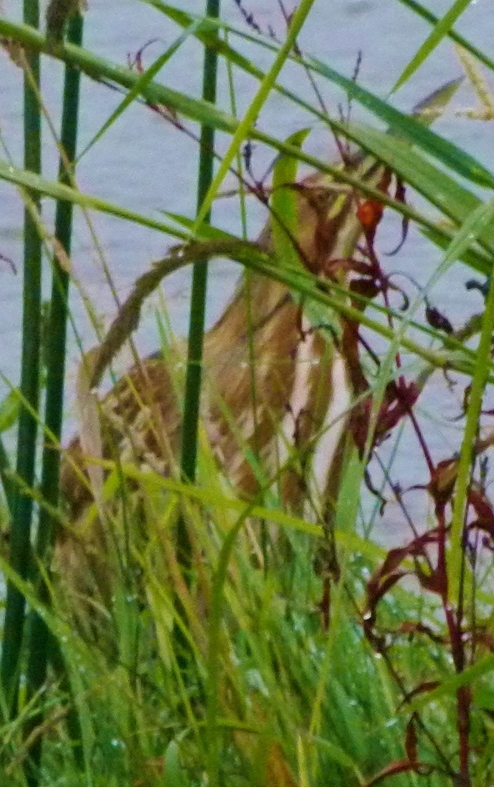 Proving the Bittern Truth can be a sweet experience, his bird moved around as if to give us a better look. Landing right in front of the kiosk. See the reed. Be the reed. 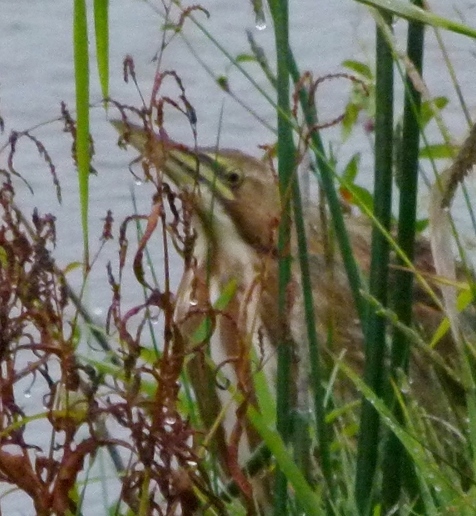 A PEEK PERFORMANCE For better Bittern pics, click here to go to Nelson’s flickr page. 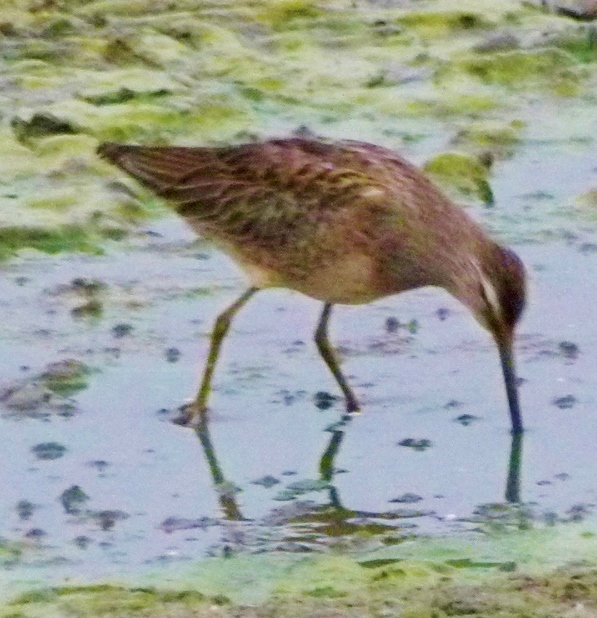 Somebody tell the Benghazi Committee in D.C. “This is what a real probe looks like.” Long-billed Dowitchers were the most plentiful of the several shorebird species we found today. Outnumbered the resident Killdeer, even. Size matters. 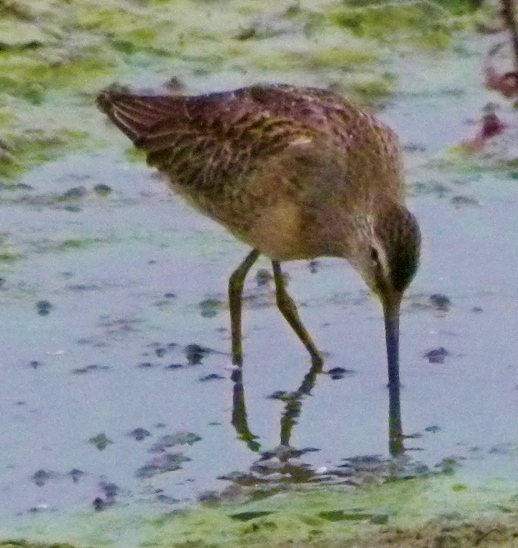 Longer legs means you can hunt in deeper water. 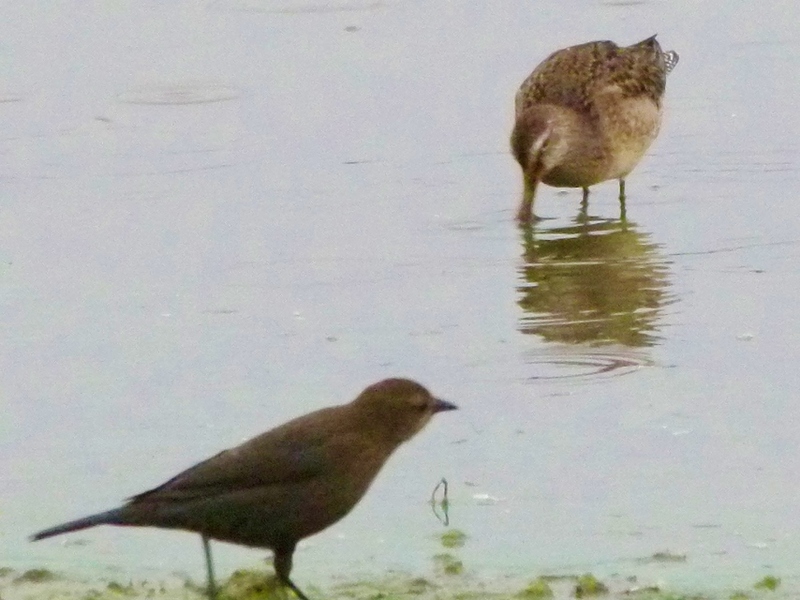 Female blackbird stays in the shallows while Mr. Dowitcher goes deep. AIR TRAFFIC OUTTA CONTROL I probably underestimated the Cackling Goose numbers by thousands. Every time a shotgun would go off, or when the eagle which passed by once…there’d be a cloud of geese cackling as they flew about. Most of the geese had left the ponds and gone westward into the grassy pastures to feed. Here’s the first-year Bald Eagle who began one goose flight frenzy. 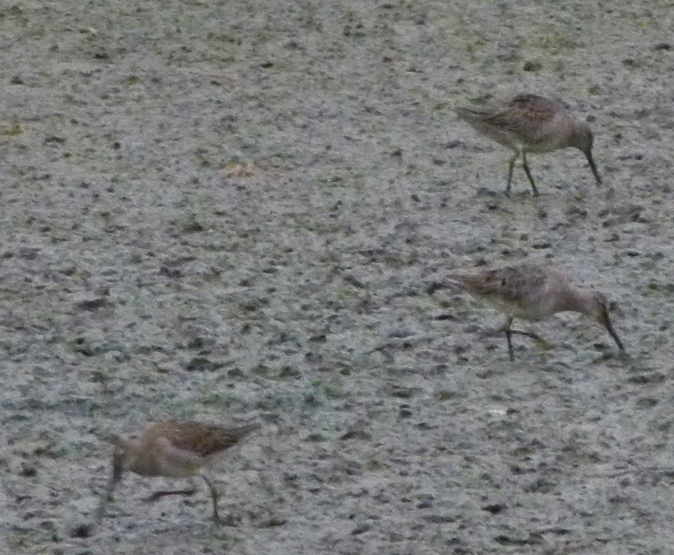 Here are some grazing Cacklers before the waves of panic hit. They look so relaxed, their necessary alertness hidden beneath that grassy-eyed look. Rather than a “gaggle of geese,” could we not refer to these as a “cackle of geese?” In one pond there were many Pintails and Green-winged Teal, tucked along the shore among the latter, a single female Wood Duck, note her giveaway white spectacle: Two-thirds of all the Dunlin we saw this morning: One of the great Egrets flying about the place.